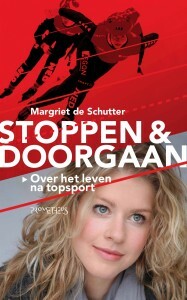 ‘In this book, former elite athlete Margriet de Schutter describes the process from within. Literally! She knows more than anyone how much energy it takes to quit doing what you love the most’. If you are a professional athlete, you want to win. You social life, your hobbies, and sometimes even your health have to make way for that one goal: a gold medal. If you reach that goal, you’re happy, but if you don’t reach the goal, and even have to quit sports, where does that leave you? And how do you go on? Stoppen en Doorgaan (Quitting and Continuing) is an open and honest book about professional sports and life after retirement. It is an inspiring book for anyone who is ready for a completely new life. With contributions by: Dennis van der Geest, Pieter van den Hoogenband, Mark Huizinga, Yvonne van Gennip, Peter Blangé, Erben Wennemars, Ada Kok, Jochem Uytdehaage, Bram Ronnes, Frank Groenendaal, Regi Blinker, Rintje Ritsma, Verona van de Leur, Peter Vergouwen and an introduction by Humberto Tan. Stoppen & Doorgaan is available for order via the contact form above.